KUALA LUMPUR (Reuters) - When then U.S. Secretary of State Hillary Clinton declared two years ago "We are back to stay" as a power in Asia, the most dramatic symbol of the policy shift was the planned deployment of 2,500 U.S. Marines in northern Australia, primed to respond to any regional conflict. At this point in time, however, there is not a single U.S. Marine in the tropical northern city of Darwin, according to the Australian defense ministry. Two hundred Marines just finished their six-month tour and will not be replaced until next year, when 1,150 Marines are due to arrive. The original goal of stationing 2,500 Marines there by 2017 remains in place, but the lack of a U.S. presence there two years after the policy was announced underlines questions about Washington's commitment to the strategic "pivot" to Asia. President Barack Obama's cancellation of a trip this week to four Asian nations and two regional summits due to the U.S. government shutdown has raised further doubts over a policy aimed at re-invigorating U.S. military and economic influence in the fast-growing region, while balancing a rising China. While U.S. and Asian diplomats downplayed the impact of Obama's no-show, the image of a dysfunctional, distracted Washington adds to perceptions that China has in some ways outflanked the U.S. pivot. "It's symptomatic of the concern in Asia over the sustainability of the American commitment," said Carl Baker, director of the Pacific Forum at the Center for Strategic and International Studies in Hawaii. 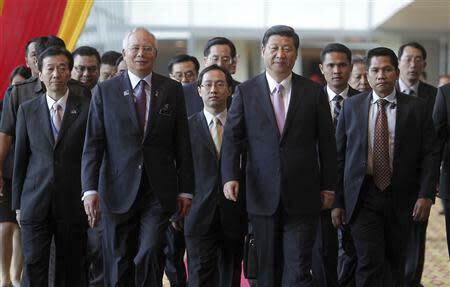 As embarrassed U.S. officials announced the cancellations last week, Chinese President Xi Jinping was in Indonesia announcing a raft of deals worth about $30 billion and then in Malaysia to announce a "comprehensive strategic partnership", including an upgrade in military ties. He was en route to this week's Asia-Pacific Economic Cooperation (APEC) summit in Bali and the East Asia Summit in Brunei, where Obama will no longer be able to press his signature trade pact or use personal diplomacy to support allies concerned at China's assertive maritime expansion. Since 2011, China has consolidated its position as the largest trade partner with most Asian countries and its direct investments in the region are surging, albeit from a much lower base than Europe, Japan and the United States. Smaller countries such as Laos and Cambodia have been drawn so strongly into China's economic orbit that they have been called "client states" of Beijing, supporting its stance in regional disputes. Leveraging its commercial ties, China is also expanding its diplomatic, political and military influence more broadly in the region, though its efforts are handicapped by lingering maritime tensions with Japan, the Philippines and several other nations. "For countries not closely allied with the U.S., Obama's no-show will reinforce their policy of bandwagoning with China," wrote Carl Thayer, emeritus professor at the Australian Defence Force Academy in Canberra. China, for instance, has been the biggest trade partner of the 10-member Association of Southeast Asian Nations (ASEAN) since 2009, and its direct investments are surging, bringing with them increased economic and diplomatic influence. Chinese companies invested $4.42 billion in Southeast Asia in 2012, up 52 percent on the previous year, according to Chinese state media citing the China-ASEAN Business Council. Investments into neighboring Vietnam rocketed 147 percent. China is demonstrating that it can deploy forces far beyond its coastal waters on patrols where they conduct complex battle exercises, according to Japanese and Western naval experts. Chinese shipyards are turning out new nuclear and conventional submarines, destroyers, missile-armed patrol boats and surface ships at a higher rate than any other country. Operating from increasingly modern ports, including a new naval base in the south of Hainan island, its warships are patrolling more regularly, in bigger numbers and further from the mainland in what is the most sweeping shift in Asia's maritime power balance since the demise of the Soviet navy. China's military diplomacy with Southeast Asia is rapidly evolving as it takes steps to promote what Beijing describes as its "peaceful rise". The Chinese navy's hospital ship Peace Ark recently treated hundreds of patients on a swing last month through Myanmar, Cambodia and Indonesia - its first such mission across Southeast Asia. Its naval vessels returning from regular international anti-piracy patrols in the Gulf of Aden have made calls in Southeast Asian ports, including Singapore and Vietnam. Still, analysts and diplomats say Beijing has a long way to go to catch up with not just the long-dominant United States, but other regional military powers such as Australia, Japan and Russia. "China has come late to the party," said Richard Bitzinger, a military analyst at Singapore's S. Rajaratnam School of International Studies. Prime Minister Lee Hsien Loong of Singapore, one of Washington's most key allies in the region, said it was disappointing Obama would not be visiting Asia. "Obviously we prefer a U.S. government which is working to one which is not. And we prefer a U.S. President who is able to travel to fulfill his international duties to one who is preoccupied with his domestic preoccupations," Lee said after arriving in Bali. "It is a very great disappointment to us President Obama is unable to visit." U.S. officials dismissed the notion that Obama's no-show would imply any weakening of the U.S. commitment to the region. Just last week, Secretary of Defense Chuck Hagel and Secretary of State John Kerry were in South Korea and Japan to reaffirm the U.S. military commitment to the two key allies, and Kerry will fill in for Obama at the two Asian summits. "The bottom line is that the United States of America is not going to change one iota the fundamental direction of the policy under this president," Kerry said on Saturday. "I think everybody in the region understands. Everybody sees this (the cancellation of the visit) as a moment in politics - an unfortunate moment - but they see it for what it is." The United States has ramped up military funding and assistance to its close ally the Philippines, expanded military exercises with other nations and increased regional port visits. From only 50 ship visits in 2010, nearly 90 ships have visited the Philippines since January this year alone. Washington has stationed surveillance planes there and promised up to $30 million in support for building and operating coastal radar stations, all aimed at improving its ally's ability to counter China's naval encroachment in the disputed South China Sea that has alarmed several Asian nations. But talks to establish a framework agreement on a regular rotational U.S. military presence in the Philippines have yet to bear fruit, and are unlikely to have been helped by Obama's cancellation of his planned visit to Manila. For the Darwin deployment, a U.S. Senate Committee said in April that it would cost $1.6 billion to build lodgings for the Marines, but the Australian government last month called for only a first-stage A$12 million ($11.3 million) tender to construct new quarters at existing Australian barracks for around 350 marines. The economic leg of the pivot, negotiations for the U.S.-led Trans-Pacific Partnership, has grown to 12 nations. But the complex three-year-old talks, which seek unprecedented access to domestic markets, are facing resistance in many countries and are unlikely to completed soon. A final deal would have to be approved by the U.S. Congress, raising the prospect of domestic politics again obstructing Asia ties. "Even if the administration could push through some agreement on the TPP, it's very unlikely there is going to be legislative success getting that through based on the acrimony that exists," said the CSIS's Baker. "...On the commercial side (of the pivot), there seems to be more rhetoric than action."